Remember that new case for the Galaxy S4 which was unveiled yesterday? The press release hit my inbox this morning with some of the technical info. It turns out that this is a lot more interesting than I expected. The new case isn't a Samsung product like I had first assumed, and the name of the product isn't "Pocketbook". No, that is the manufacturer. This new case is called the CoverReader, and it is a new product from the Ukrainian ereader maker Pocketbook. I don't have details on the screen resolution yet, but I do know that this isn't an E-ink screen. The 4.8" screen is made by PlasticLogic, makers of the ill-fated Que ereader. It looks they found a new use for their screen tech, and it's one where their tech is actually better suited for the purpose than an E-ink screen. Plastic Logic's screens have a range of benefits – such screens are flexible, shatterproof, ultra-thin, ultra-lightweight, power saving and daylight readable. Update: It looks like Plastic Logic's press release may have gotten ahead of itself. This first model has a glass backplane with an E-ink screen, not the plastic backplane that Plastic Logic is famous for. That means that the first CoverReader units won't be nearly as sturdy as the later units. Unfortunately, I don't have the more important details like price, release date, or screen resolution; they weren't shared by Pocketbook. But I do know that Plastic Logic will be making the new 4.8" screen in their Dresden manufacturing facility. Update: This case is expected to be released in October 2013 with a retail of 99 euros. I can confirm that the secondary screen uses the CPU and battery of the smartphone and cannot operate without it. I can also tell you that Pocketbook plans to release other cases for other smartphones including ones not made by Samsung. The most important question for me is: does it work with other phones? I know I will not be able to attach it as a cover to a different phone, but it doesn’t seem to have any electrical connection to the phone. You see … I just LOVE that cover, but I will not be able to buy a phone for 550Eur just because it has a very fancy cover. This device will use the usual E-Ink screen with a glass backplate. Only a second generation of the CoverReader will possibly have a Plastic Logic screen. (A forum post by a Pocketbook representative). 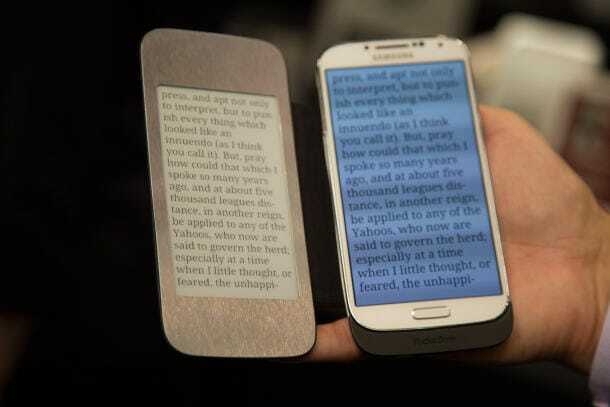 I think it’s a cool idea, but I’m waiting for the phone cover where you open it and unfold a screen that’s twice as big so you have a bigger reading surface. Until then, my Kindle PW stays in my purse. As someone before me already said, the PL model will be next generation. Right now, we (PocketBook)will use an e-ink screen with quite a few new specifications. As already said before, the launch time will be sometime in October.